Having left myself a lot to do on the day I planned to head out, I ended up getting a late start. I originally planned to see my great-uncle in NJ, but I called and told him I'd be running a little behind. Uncle Bernard was concerned for me as there were thunderstorms predicted in his area in the afternoon, so he suggested I just drive straight on down to Philly. That's Uncle Bernard, always putting others before himself... I was disappointed and mad with myself on getting such a late start, but he assured me it was fine and said I could catch him on my way back to the area or at a later date after I return home. 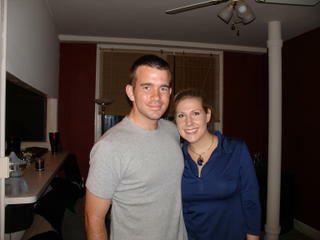 So I drove straight down from JC to Philadelphia, where my friends Adam and Jenna live. I met Jenna years ago when she was a student at Binghamton University, I was at BCC, and we both worked at Kohl's together. She moved to NJ for school, met Adam, and there couldn't be a nicer couple. The two of them live downtown (Center City). I picked up Jenna at her work, we went to dinner, drove back to her work's parking lot, left the car there, and took a bus downtown. As today is the Live 8 concert, Adam and Jenna felt it would be best and safest leaving the car out there in the suburbs than parking it downtown (if there were even spots available). We met up with Adam's sister, her boyfriend, and another couple they knew, hung out at their apartment for a while (where I fell asleep for a bit on the couch), and then walked to a friend of their's who was hosting a pre-Live 8 party. The 8 represents 8 world cities that are hosting huge concerts to fight world poverty. Philly is one of them, and the city has made huge preparations for it. A lot of big names are coming into town for this one day...Maroon 5, Black Eyed Peas, Dave Matthews Band, Jay-Z, and Rob Thomas, among others. Its expected to get a bit crazy, so I've been told a lot of people who live here have gone away for the weekend to avoid the crowds; but if you didn't go away, most likely you would be attending the concert. Anyhow, got up early this morning to try to avoid a little traffic...I'll be heading further south today (no kidding! ), and I think my first stop might be Shenandoah National Park in Northwest Virginia. From there, I'll probably head towards Norfolk, in SE Virginia, to visit my friend Chris. Thanks, everyone, for all your nice thoughts. The first stop was a good one... hopefully more to come.